Hey Guys! You've landed on New Orleans USA Did you know the factory ships out free all over America twice everyday. See USA Home Page here. Slogan: Come out to the most exciting Southern Crawfish Boil in history! 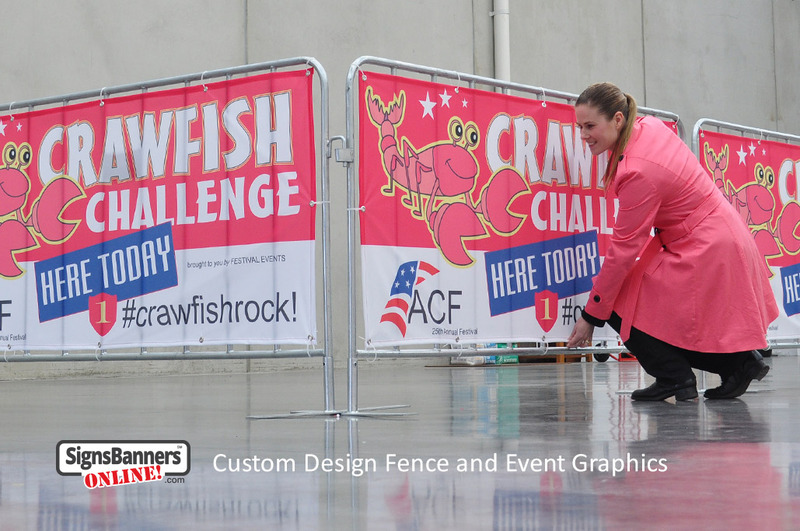 Set of portable event and festival crowd barriers that are carried to each scene and used to queue (corral) customers for entry to the most exciting crawfish boil eating day in the world. Many event companies use this website for purchasing custom size and custom roll length prints. Direct to print. Your designer can make any creative any size. Digital printed means you can suggest short runs, cross over panelling and multiple art sets. Quick Deploy. Select grommet eyelets to suit your budget or fitting applications. Calculator allows management companies to split volumes across many panels by adjusting the QTY fields matched to the sponsor level. Advanced systems offer clients access to factory manufacturing stage completions eg: cutting complete, sewing begun etc. 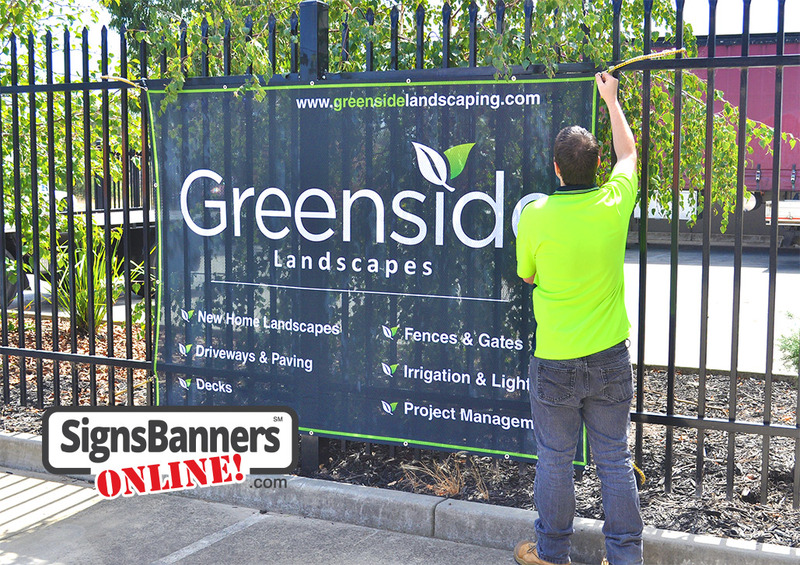 Printed event banners and signs can be stored and re-used. Factory Direct. Clients/Agencies are purchasing from a factory. Event graphics are made to fit. All you need to do is order via the calculator page or easy template page, input the sizes and choices of your banner. Arranging your event graphics from the factory is easy. Input the desired 'sectional' lengths of your runs, the height and 'how many'. Once you have determined the quantity and size, use the 'order & upload' page, enter your shipping label details and upload. Uploaded files appear in the printing queue instantly and your print order begins. 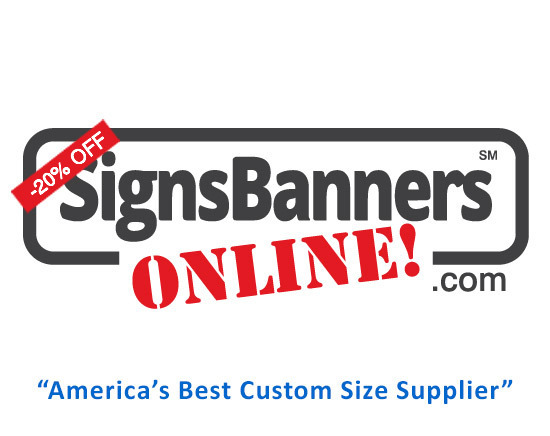 From New Orleans LA to North Dakota ND, these new cheap banners online are ideal for the single day use or multi-event fixing. DuraSports Mesh is particularly designed for filmed events, cameras and video. The material has anti'flare properties making it ideal for corporate use. As a wholesale customer you'll be accessing the factory direct from the comfort of your office or device. 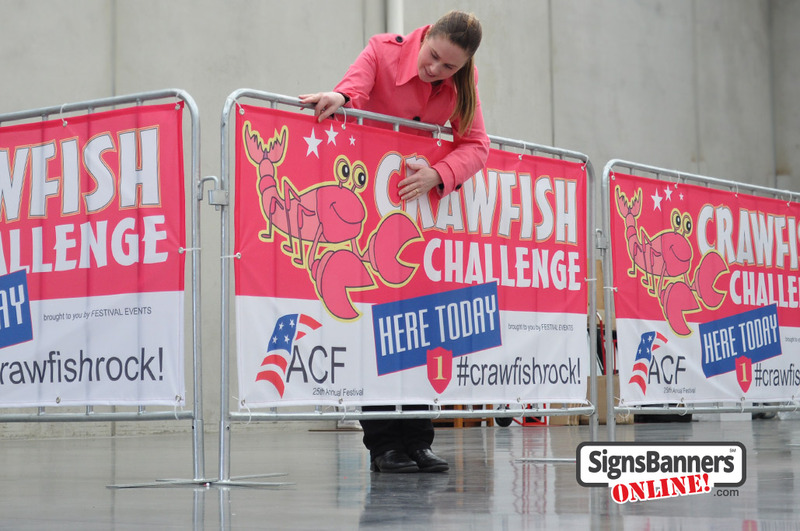 Within minutes you'll be able to order any length event signage for your Louisiana events or any location county in USA. If you've spent time at the event tying up banners, you'll know and understand why longer span printing on event signage is better.. AND... you can choose how far apart the grommet eyelets are too! Printed to size including handy grommet eyelets, your team can be fitting the signage in minutes, all you need is a packet of zip ties. Manufactured for multi event use, you can transport your signage in this manner (folded in a box or bag=yes) to any event location in Louisiana or across America. Using high intensity colors and non reflective material means your customers are seen. These examples for St.Louis Crawfish show how intensity of color is produced. High Intensity colors via Sub-lamation printing techniques onto the printable signage display grade coated polyesters. Saving a few dimes per sq foot is useless compared to starting correctly with high intensity capable fabric printing materials. 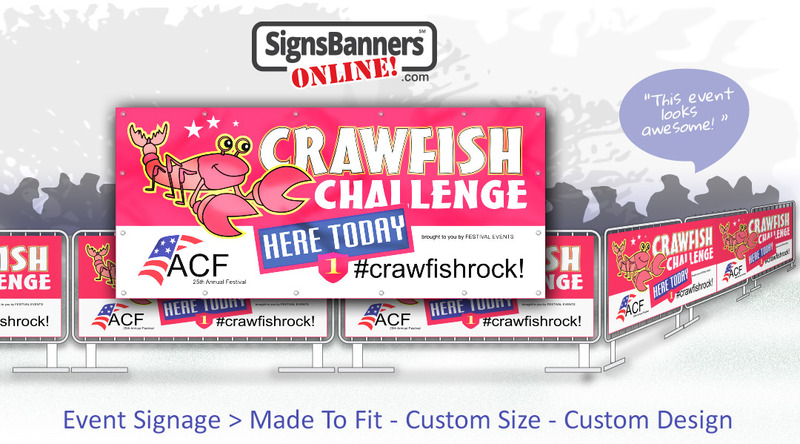 So if your looking to gain results like these for your Watermelon Festival or Crawfish Challenge, we hope you investigate the potential Signs Banners Online offers you. If you're using the most famous brand fencing panels in America or spanning across portable frames and containment fencing for events you'll be excited to know that you can choose any custom size matched to your purpose. United services: Singles, Double, Mulit set and Mileage is all achieved by quantity discounting of these cheap banners for Louisiana and all other areas. The product is shipped out everywhere. When you're gathering together and confining a group of people it pays to print the banner on the fence. A top business feature is that vendors or sponsors can use 1 or 500 sets to be equally effect to the viewer. As a modern management system the sponsor sign at a community event is a winner. 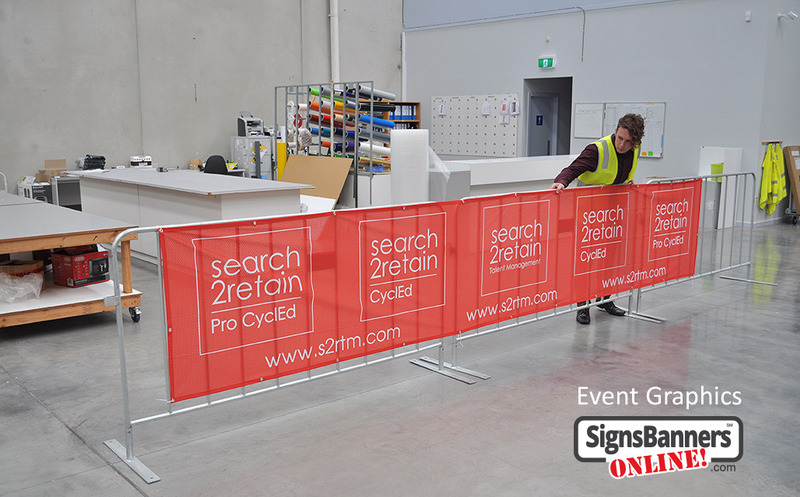 Keeping flexibility and price low, the simple barricade with a sign series makes events cheap to manage, run operate and control. This image shows the creativity applied and how flexible and cheap the banner sign is. 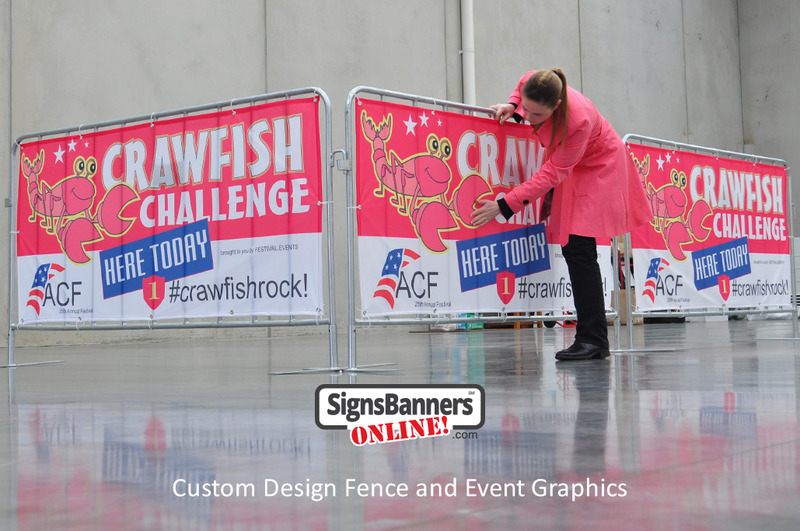 The biggest advantage of the 3'ft barrier is that you can add any graphics, it keeps the excitement close. 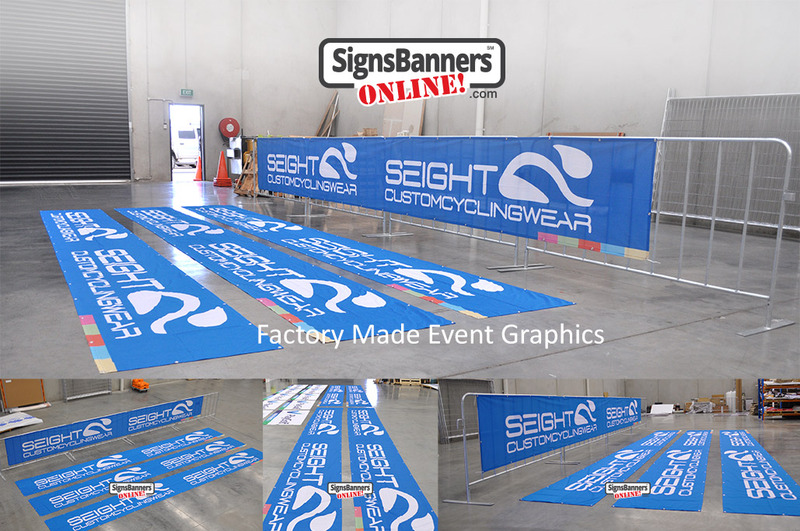 As a prime source for America's event industry, Signs Banners Online supply factory made to you custom design and custom size event printing services such as these printed barrricade jacket runners, or as they are known in the event world as printed runners. 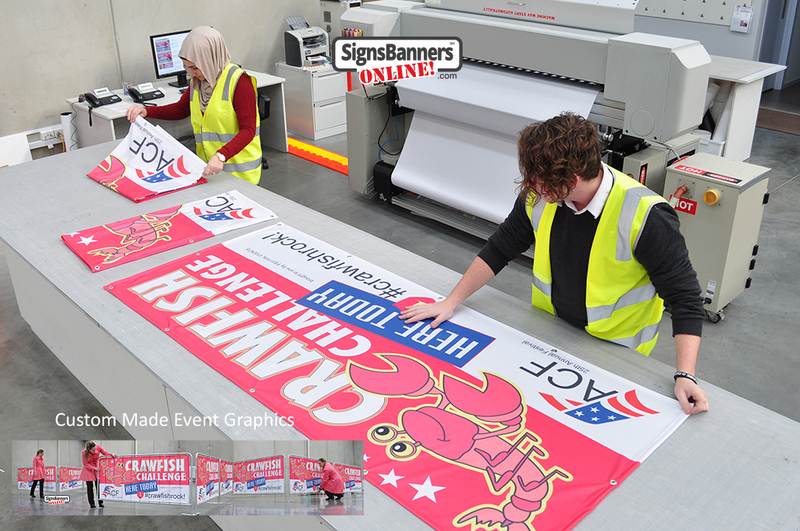 The dimensions can be any size and discounts are given to ordering quantities because after the initial print set up procedures are complete it is better to continue the grand format machinery printing the banner material used for sport and community festivals to save costs. This photo shows the wide roll of poly material used to produce event signage. It also shows the finished printing and cut-to-size custom graphics. Each banner has grommet eyelets and is being packed for shipping. New Orleans New Orleans is a major United States port and the largest city and metropolitan area in the state of Louisiana, our trade clients enjoy rapid banner printing and delivery.